Derived from the verb (ḳal ), "to report," "to explain," "to narrate." 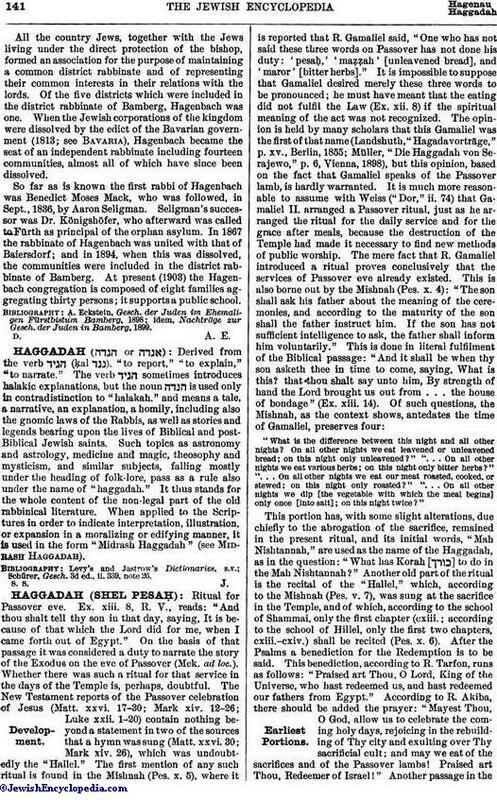 The verb sometimes introduces halakic explanations, but the noun is used only in contradistinction to "halakah," and means a tale, a narrative, an explanation, a homily, including also the gnomic laws of the Rabbis, as well as stories and legends bearing upon the lives of Biblical and post-Biblical Jewish saints. Such topics as astronomy and astrology, medicine and magic, theosophy and mysticism, and similar subjects, falling mostly under the heading of folk-lore, pass as a rule also under the name of "haggadah." It thus stands for the whole content of the non-legal part of the old rabbinical literature. When applied to the Scriptures in order to indicate interpretation, illustration, or expansion in a moralizing or edifying manner, it is used in the form "Midrash Haggadah" (see Midrash Haggadah). Schürer, Gesch. 3d ed., ii. 339, note 26.